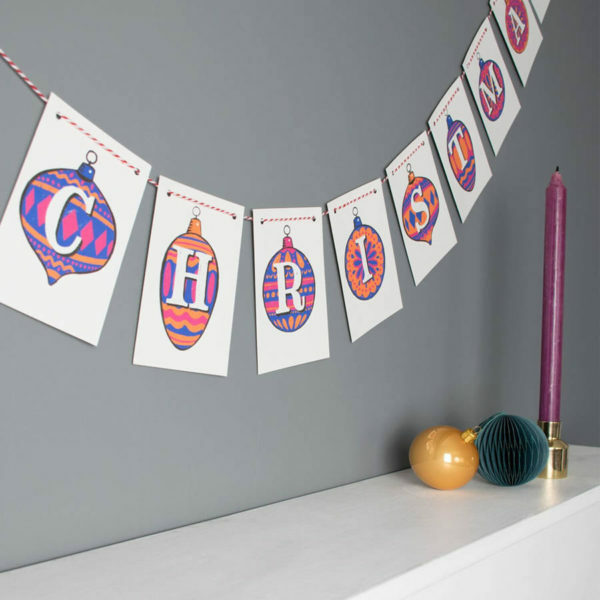 Christmas Bauble Bunting – add some festive flair to your house this Christmas with our stylish hand drawn letter bauble bunting. Each of the flags includes a letter surrounded by our hand-drawn bauble design. You can choose from ‘Merry Christmas’, ‘Seasons greetings’ or ‘Happy Christmas’. The fun, quirky design and bold typography really stand out, making it perfect for Christmas parties!The pink, blue and orange palette will add a splash of bright, luxurious colour to your home .The stylish bunting will look great hung over a mantel, strung against a wall or across a window.The bunting has been hand-illustrated by Steven Gander in our studio in Kent before being digitally printed onto luxury cream card. The bold typography and deluxe materials are modern and high quality to add a bit of festive flair to your house this Christmas!The bunting is already strung and ready to hang.The bunting isn’t waterproof so please use only as an indoor decoration.